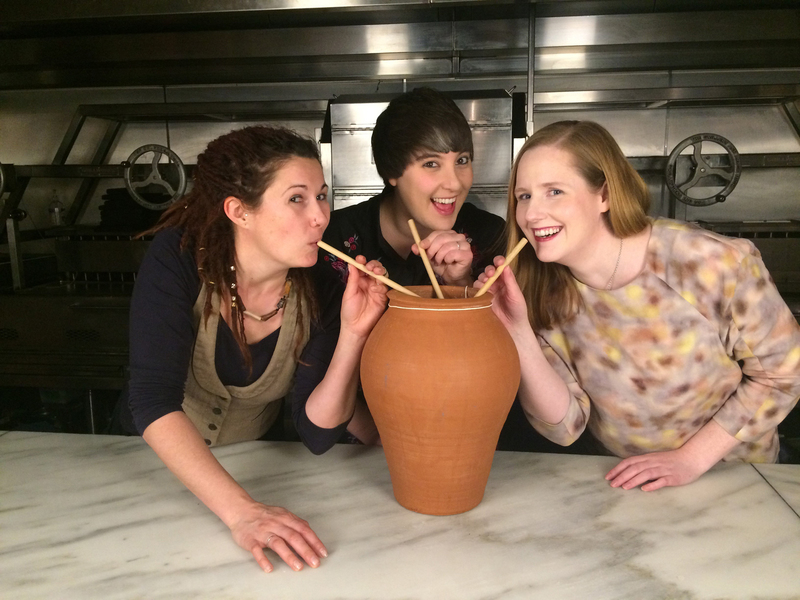 As part of the Pleasant vices series, food historian Tasha Marks invited brewers Michaela Charles and Susan Boyle to help her recreate a 5,000-year-old beer. Beer was a result of the Agricultural Revolution (c. 10,000 BC), as fermentation was an accidental by-product of the gathering of wild grain. It’s said that beer was not invented but discovered, yet the manufacturing of beer was an active choice and the ancient Egyptians produced and consumed it in huge volumes. When I began this project, like many of my contemporaries I believed that ancient Egyptian beer would be revolting. I expected a thick, tasteless, gruel-like mixture that was mildly alcoholic. But the brewers on the team thought otherwise – quite rightly they argued there was no way the Egyptians would be making beer in such quantities if it was not good. But to all of our surprise, it didn’t just work, but it was absolutely delicious! Using traditional methods and ingredients, we aimed to get as close as possible to a beer the ancient Egyptians would have drunk. Our research started in the British Museum, using objects in Rooms 62 and 63 to guide our initial research. We had further input from curators and physical anthropologists to focus our findings, and used archaeological reports and chemical analysis of pots to refine our method. We were also guided by an ancient Sumerian poem, the Hymn to Ninkasi (goddess of beer). Our contemporary ceramic vessel. Photo: Tasha Marks. So, how is ancient Egyptian beer different from what we drink today? Then: In ancient Egypt, beer was so essential it was treated principally as a type of food – it was consumed daily and in great quantities at religious festivals and celebrations. Beer was an essential for labourers, like those who built the pyramids of Giza, who were provided with a daily ration of 1⅓ gallons (over 10 pints). Yet it still had divine status, with several gods and goddesses associated with beer. Hathor, the goddess of love, dance and beauty, was also known as ‘The Lady of Drunkenness’. 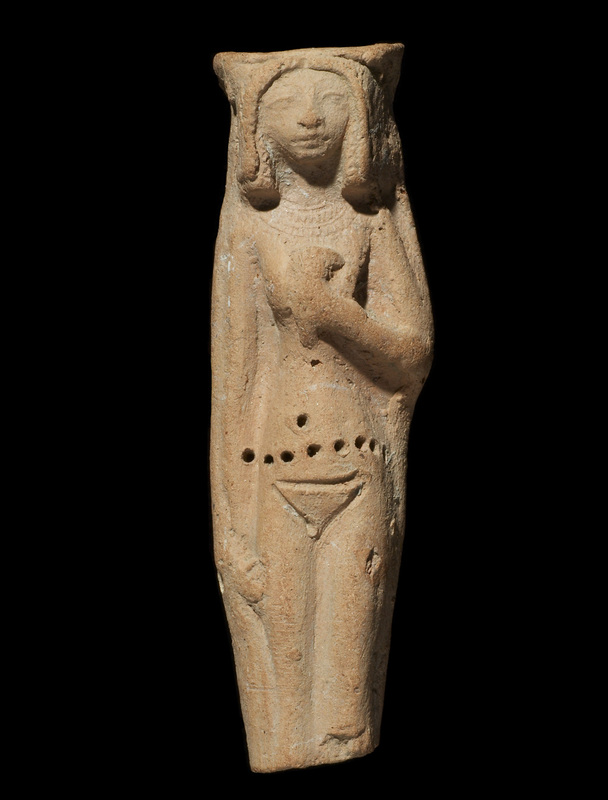 Female figure with face of Hathor. From the Temple of Hathor, Faras, Nubia (in modern Sudan), 18th Dynasty (c. 1550–1292 BC). Then: In the Museum’s Egyptian galleries, you can see models excavated from tombs which show wooden figures of brewers straining mash through a cloth into ceramic vessels. This visual clue, alongside the research of Delwen Samuel, led us to use a two-stage mash, which we then left to ferment in a vessel containing a harvested yeast culture. The advantage of a two-stage mash is its simplicity. The cold mash is made using ambient temperature water and a malted, ground grain. This mash will contain all the active enzymes required to convert starch to sugar. The second mash, which is processed at the same time, consists of ground, unmalted grain. This is mixed with hot water and further heated. 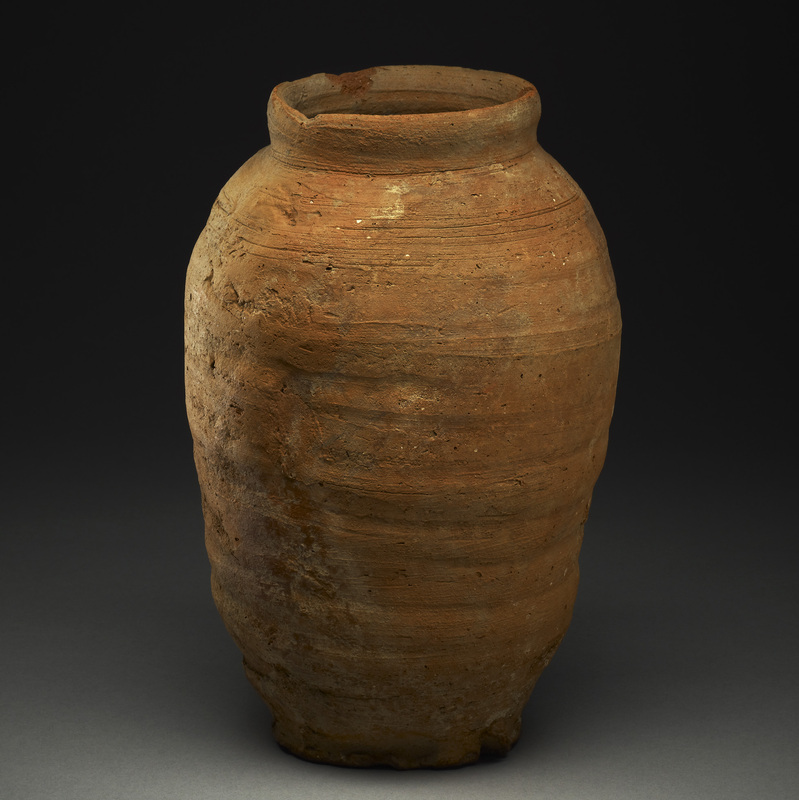 There is evidence of heat exposure on ceramic brewing vessels found in Egypt. It is unlikely that earthenware would be heated above 80 degrees (as it would compromise the material), so this was the temperature to which we heated the hot portion of the mash. Heating grain to this temperature allows the starches present to unravel, but kills the enzymes. By preparing the two mixtures separately and then combining them, both the accessible starches and the enzymes required to convert them are present in the final mix. The hot mash and the cold mash were mixed together and left to cool, so that the enzymes could start to convert the starches in the grains to fermentable sugars. When cool, the mash was sieved of any residual grain, directly into the terracotta fermenting vessel, which had been pre-inoculated with a harvested yeast strain. More warm water was used to rinse remaining starches and sugars form the grains. The vessel was covered with a muslin cloth and left to ferment. The resulting beer would have been drunk while still actively fermenting from the ceramic vessel itself. Now: In modern brewing all of the grain is processed together in a single mixture, within a very narrow temperature window. It is then boiled, which halts any further starch conversion. After which it is cooled and yeast is added. This process allows modern brewers to utilise up to 80–85% of the fermentable sugars. In our ancient Egyptian beer, because there was no boil, all of the starches were converted into sugars and the maximum end amount of alcohol was produced, making it 100% efficient. 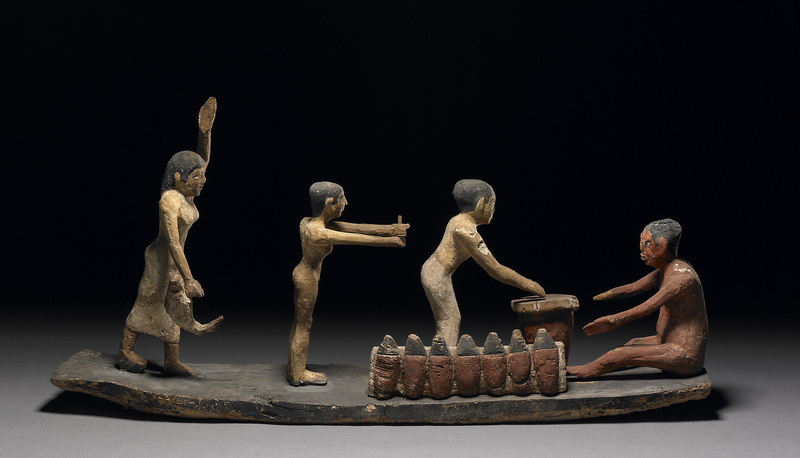 Painted wooden model of four figures preparing food and beer. From Sidmant, Egypt, 6th Dynasty (c. 2345–2181 BC). 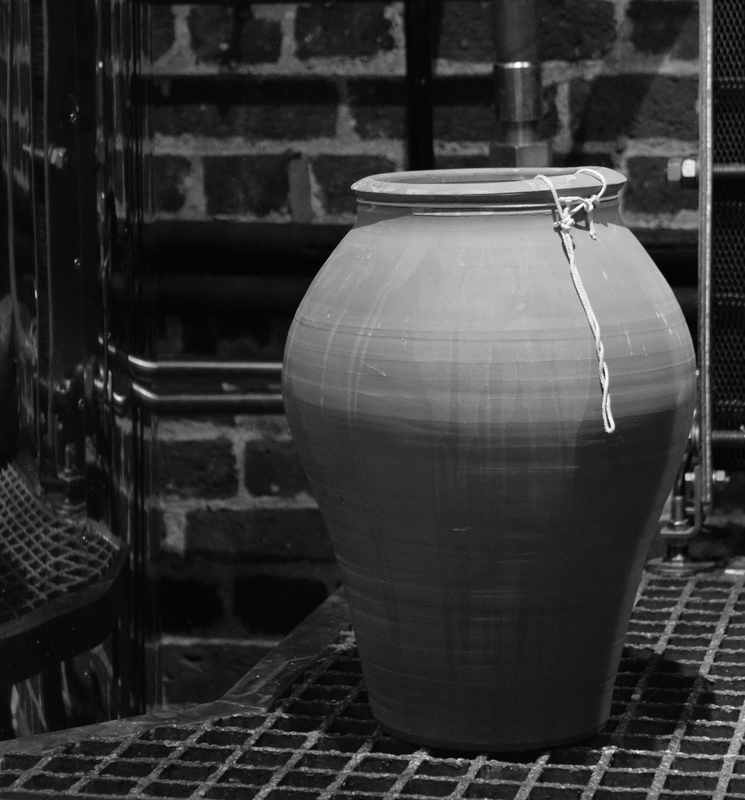 Then: The ceramic vessel is key to the ancient Egyptian fermenting process, as its porous interior is the ideal surface for the wild yeast culture to grow. It is also cooler to the touch than the ambient temperature, which would be an obvious advantage to brewing in a hot arid climate. With this in mind, it was incredibly fortunate that the father of Michaela Charles (our excellent brewer) is a ceramicist! Inspired by objects in the British Museum’s collection, David White was able to create a contemporary ceramic vessel for us in which to ferment the beer. In keeping with examples in the Museum, it was unglazed but was single fired to a higher level to reduce porosity. It had a wide, open mouth to allow air to circulate and encourage wild yeast to enter. The slight evaporation from its walls also cooled the fermentation. Now: Modern brewing almost exclusively happens in stainless steel, with wild or harvested yeast cultivation being discouraged in favour of single-strain brewer’s yeast, added in a controlled environment. Pottery beer jar. From Esna, Egypt, Second Intermediate Period (c. 1650–1550 BC). Then: The beer was unlikely to have been decanted from many of these large ceramic vessels so a drinking straw was a must. Many academics believe the straw was to prevent sediment being consumed by the drinker. There is an element of that, however it’s also likely to be about hygiene, as many people would have drunk from the same vessel – a bit like one of those fishbowl cocktails served in bars and clubs today. Egyptian straws would have been made from clay, with holes or a filter at the end to sieve out some of the sediment. These are several much later (early 20th century) examples in the Museum’s collection made from reeds, which may also have been a likely material for ancient Egyptian straws. Now: You’d probably be laughed out the pub if you used a straw to drink your pint. Beer-drinking straw made of reed. Zambia, 20th century. Then: The most noticeable absence in ancient Egyptian beer is hops, as these were not in use until the medieval period. The grain, too, is different, as ancient grain would have been higher in protein and predates modern varieties of wheat and barley. 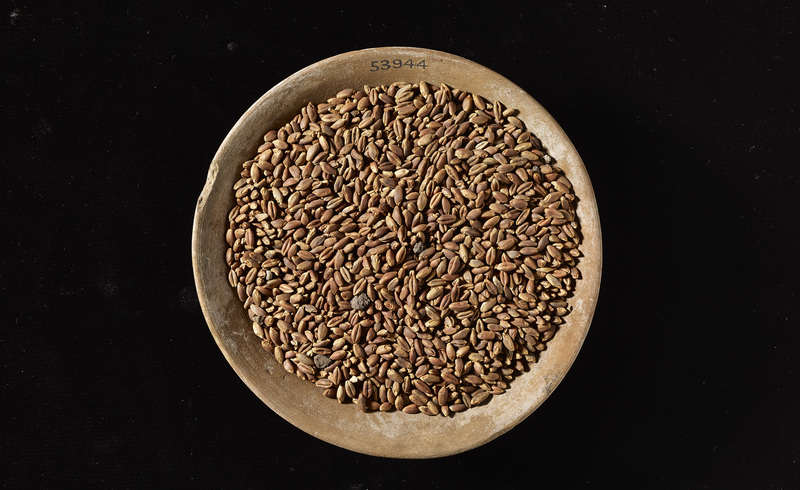 For our ancient Egyptian beer we used emmer, the earliest precursor to modern wheat. It was widely grown in the Fertile Crescent and has been identified by Delwen Samuel and her team on brewery excavations in the ancient workers’ village of Amarna, built in 1350 BC. Although beer was not routinely made using dates or other flavourings, we decided to present a possible version of a royal brew. Spices and sweetness were a mark of status and I believe that the royal brewery would have been likely to create a more luxurious beer for its illustrious consumers. We paid a visit to the organic store at the British Museum, where we were able to see 5,000-year-old examples of emmer, barley, pomegranates, figs and other edible offerings. Inspired by the experience, we added an Egyptian-style spice mix called dukkah to the brew. Our blend consisted of rose petals, pistachios (the resin of which was also used in Egyptian embalming), sesame seeds, coriander and cumin seed. This is also influenced by the aromatic resins and garlands used in ancient Egyptian funeral preparations. We also tried adding dates, to further enrich the brew and help the wild yeast, as the sugars speed up the fermentation. Now: All modern beers are made with barley unless they specify otherwise. Hops are a near permanent feature, and flavourings are widespread and experimental. From Earl Grey tea to bacon, we love a flavoured beer – there’s even one with snake’s venom! Brownware pottery dish containing emmer wheat and barley. To look back on it now, the Egyptian method makes a fool of modern brewers. We have added so many steps to improve on ancient methods, but our trial illustrates that ancient Egyptian beer ferments faster and is materially more efficient. Working without thermometers and starch tests, without the microbiology of yeast and enzyme conversion, the ancient Egyptian brewers created a crisp refreshing beer, that could have been made continuously in huge volumes. It is amazing that one can look back and assume the ancient knowledge was lacking in some way. Perhaps there wasn’t a need to store beer for long periods? Perhaps there was a perfectly good method of extending the shelf life of a beer that we have not found evidence of. But I think it is a mistake to look back into history and assume it was in more primitive or less extraordinary than what we can produce today. Tasha Marks is a food historian, artist and the founder of AVM Curiosities. With thanks to Michaela Charles, Head Brewer at the AlphaBeta Brewery, and Susan Boyle, Beer and Wine Consultant at Two Sisters Brewing. Join Tasha, Susan and other guests from our Pleasant vices series at a special panel discussion on Friday 25 May to discover more delectable treats inspired by history and the Museum’s collection.